Teens from Binyamin region arrive in Knesset, distribute game focused on Supreme Court to Knesset members. Binyamin youth arriving at the Knesset on Wednesday distributed sets of Quartets to Knesset members. The subject of their Quartets game was Israel's Supreme Court. After the youth had spent half an hour distributing the game, Knesset security arrested them, apparently in response to a complaint. The youth were then brought to the government floor, where they were met by MK Bezalel Smotrich (Jewish Home). Earlier, Smotrich had invited the youth to the Knesset in order to allow them to express their stance to the various Knesset members. When Smotrich and the Knesset's chief security guard finished their discussion, the youth were removed from the Knesset. Smotrich explained to the guards that the game represented a legitimate point of view, and was not protest material or political. 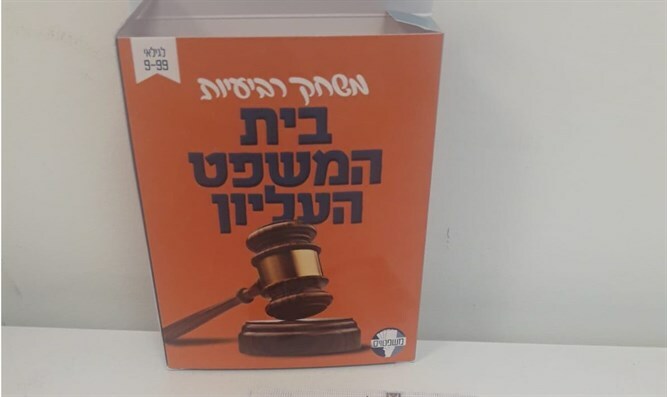 Therefore, he said, he and others would continue distributing the game to Knesset members during the coming days, aiding the youth in their mission of bringing their viewpoint to the attention of all MKs. Maor, one of he girls who distributed the game, said, "We came to the Knesset from Ofra, in order to distribute games on the subject of the Regulation Law and awaken in Knesset members an awareness of the issue. Suddenly, the Knesset guard pounced on us, arrested us, and took us. Afterwards, we were taken to MK Smotrich's room, to wait until we would be led outside." Smotrich, who initiated Israel's Regulation Law, said, "In the kingdom of democracy, the Israeli Knesset does not allow youth whose homes are in danger of demolition to act and express their protest. That's mostly sad. I will work to change this provocative policy, and I will work to make the Knesset accessible to Israeli citizens, and to allow them to express their distress to publicly elected figures." The Regulation Law legalizes and protects thousands of Jewish homes in Judea and Samaria which were built with government backing and lacked absentee land claims, but against which there are now property claims. The law was frozen by Israel's Supreme Court in December. Currently, hundreds of homes in Ofra are in danger of demolition after Palestinian Authority Arabs claimed the land they were built on, decades after they were built.